Something you may not know about me... I'm married to a Ghostbuster! 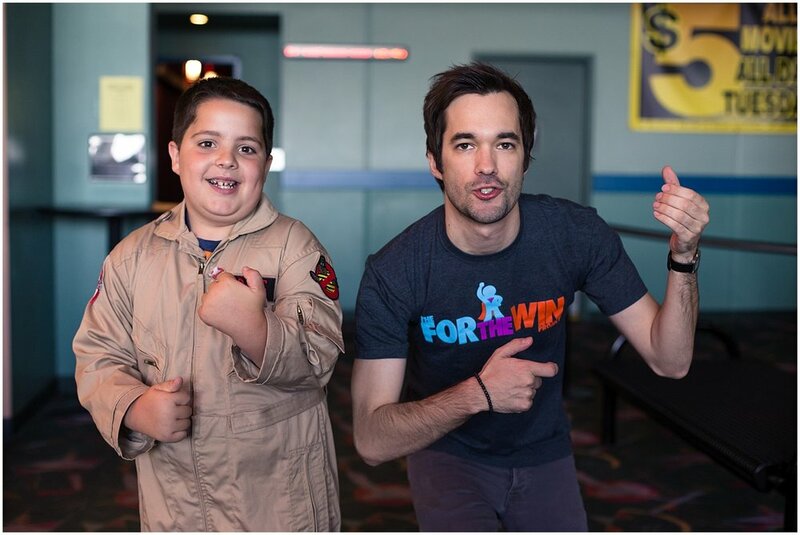 My husband Andrew is co-founder of the local Iowa group of avid Ghostbusters fans who go around in costume, to comic conventions, parades, screenings, special events, charities, and even kids' birthday parties, to have a blast and make people happy. There are certainly worse ways to spend your time! One of their favorite adventures started with a little boy named Braden. His mom Michelle contacted the Iowa Ghostbusters after seeing them at an event to let them know she was raising a super fan and wanted to surprise him for his birthday. Little did we know what would come of this. I went along to be paparazzi and capture the surprise. It was an amazing feeling for everyone involved to see the shock and awe on his face. This is what it's all about. Andrew and fellow buster, Matthew, agreed that it was one of their favorite moments in costume. Their love for the film goes back to their childhood and it was surreal to be playing the heroes they looked up to as kids, now, for another kid who felt just as they had. We hadn't known beforehand, but were soon filled in that Braden has a respiratory disease and has spent too much of his childhood sick and in a hospital bed. With mom's permission, we told his story along with the photos I shared from the party. And it didn't stop there, the story soon went viral. We started seeing it retold by bloggers, news media, and magazines all over the internet! The family was contacted by the local paper where they also reported on Braden the junior Ghostbuster. And then the craziest thing happened... Braden was asked to fly out to California, star in his own little Ghostbuster trailer and get a movie poster made. A GoFundMe was created, funds were raised, and this little guy experienced what dreams are made of! There was a special screening of him film at Clinton's own Clinton 8 Theater, where he was also presented with his movie poster. It was a wonderful event and I was honored to be a part of it! But first...check out Braden's video!